The Queen's schedule while she is in Ireland is remarkable and a testament to how all has changed utterly in Irish-British relations. She will visit the Garden of Remembrance in Dublin which honors all those who fell fighting for Irish freedom--and against the monarchy she represents. One wonders what she will think as she commemorates Fenian dynamiters, IRA volunteers and 'traitors' to the British upper calls like Sir Roger Casement. It can only be healthy however, to walk in another nation's shoes even for a short time. And it will be good for Ireland too to acknowledge the major effort by the British monarch to lay the past to rest. The notion a few years ago that the Queen would visit Croke Park, bastion of the GAA, Ireland's home grown games of hurling and football set up in direct opposition to British games like rugby and soccer, is incredible. For decades, GAA members were now allowed to play soccer or rugby, the infamous ban rule which has long since been banished. 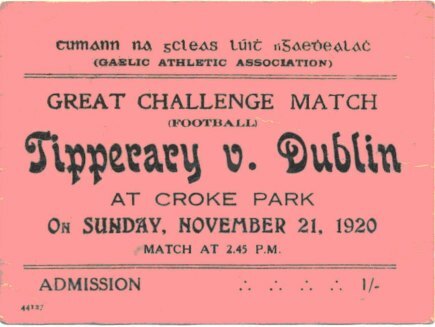 The Hogan Stand there is called after a Tipperary footballer gunned down by the British who attacked the crowd at a Croke Park game during the Irish war of Independence on Bloody Sunday, November 21 1920 .all in the name of the British monarch. That scene is vividly caught with some Hollywood panache in the movie Michael Collins. The killings were in retaliation for the Michael Collins inspired wipe-out the same day of the so called 'Cairo Gang' British intelligence operatives who had infiltrated the IRA. BY allowing this step the GAA has covered itself in glory once again. This week it stood foursquare behind the rights of Catholic men to join the new Northern Ireland police force and members shouldered the coffin of the murdered policeman Ronan Kerr. As other bastions of Irish life have brought disgrace on their heads such as the Catholic Church and corrupt government, the GAA has been a beacon of hope. They ended the ban, allowed soccer and rugby internationals in Croke Park, declared their hand early in the peace process and have now welcomed the British queen to the very bastion of anti- British monarchy sentiment in Ireland. If only other Irish institutions had shown such bravery. All in all, the queen's visit will bring about a new era where bitter enemies will toast each other's hero's and revisit the old certainties of their sad and sorry histories together. Hopefully a new chapter will now be written.